During the last six months, more than a billion people may have experienced that their computers suddenly get slower, louder and warmer while browsing. These could be symptoms that they’re victims of cryptocurrency mining, also known as cryptojacking. 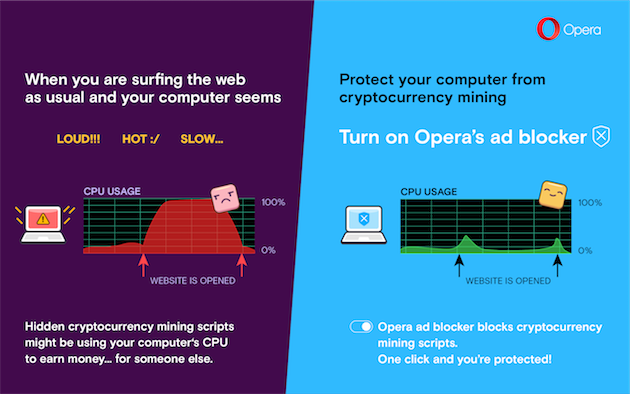 Today, Opera becomes the first major browser to add protection against such attacks with the new anti-cryptocurrency mining feature. In just one click, everyone can now protect themselves from falling prey to cryptojacking. “We are fans of cryptocurrencies but we simply don’t accept that websites are using people’s computers to mine coins without their knowledge or consent. With the new Opera 50, we want to kick off 2018 by providing people a simple way to regain control of their computers,” said Krystian Kolondra, head of Desktop Browser at Opera. According to some reports, as many as one billion people might be affected by cryptojacking, a process in which websites run scripts on users’ computers without their consent or knowledge to mine cryptocurrencies. “Everyone knows the feeling of the computer heating up, the fan starting to go crazy and the CPU going to 100 percent for seemingly no reason. These are all signs someone might be mining bitcoins or other cryptocurrencies on your computer,” said Krystian Kolondra. Opera 50 puts an end to this in just one click. All you need to do is open the browser and activate the built-in ad blocker in settings, where the anti-cryptocurrency mining feature has been automatically switched on. Those who wish to see ads but want to stay protected from cryptojacking can activate the tool separately by checking the “No Coin” tick box in preferences. Opera’s unique new feature blocks scripts that some websites run on our devices to mine cryptocurrencies. It is based on the NoCoin list of cryptocurrency mining scripts, which is updated on a regular basis. Opera 50 also comes with several other new features, including Chromecast, which allows everyone to stream content from their desktop directly to the TV screen, and VR360 support for Oculus Rift. You can read more about Opera 50 here and download the new browser from opera.com.